Kevin Guthrie and Sheila Hancock in Edie. OPENING THIS weekend at the Eye Cinema is Edie, scripted by Galway writer Elizabeth O'Halloran and starring Sheila Hancock. Set in Scotland, it features Hancock in the performance of her career, as Edie, a cantankerous mountain climber. Following the death of her controlling husband, Edie attempts to fulfil a life-long dream she long thought impossible - to climb Suilven, a demanding mountain in the Scottish Highlands. 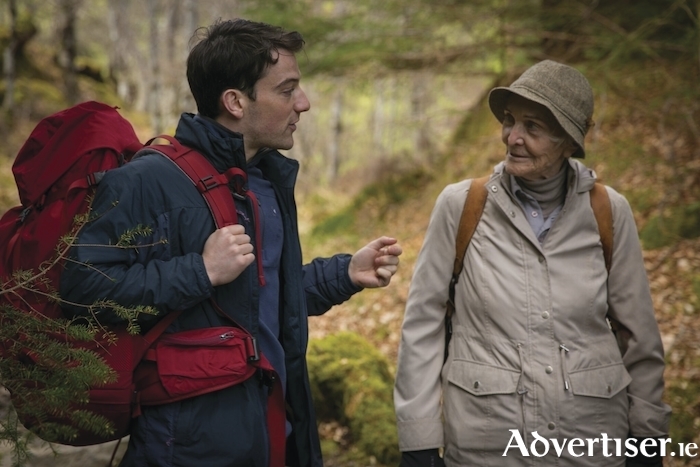 At the age of 83, and against her daughter’s wishes, Edie heads to Scotland and employs Jonny (Kevin Guthrie - Dunkirk, Sunset Song ) to help her prepare for the gruelling climb, sparking an unusual friendship. The film received its World Premiere at the 2017 Edinburgh International Film Festival, where it was nominated for the prestigious Michael Powell award. It won the International Narrative Film award at the 2018 Cleveland International film festival. O’Halloran was first approached to write the screenplay in 2010, while living in London. “It was important to me that even though the film was set in such a beautiful part of the world, that it didn’t just romanticise rural life," she said. "We wanted it to feel real.” According to the film’s director, Simon Hunter, it was the screenplay that attracted Sheila Hancock to the role. Edie screens at The Eye on Friday May 25. For bookings see www.eyecinema.ie or call 091 - 780078.